The West End of Adelaide has done a great job recently of rejuvenating the tired streets full of dilapidated shops and crummy convenience stores. Once a somewhat snubbed region of the CBD, Waymouth Street has become one of the most progressive foodie destinations in the City of Adelaide. You can get in touch with your inner Italian at Dom’s Bistro, enjoy the best of seasonal produce at Press Food and Wine or escape to the rooftop at the Gallery to enjoy a sundowner. There is no doubt; competition in this precinct is getting fierce. 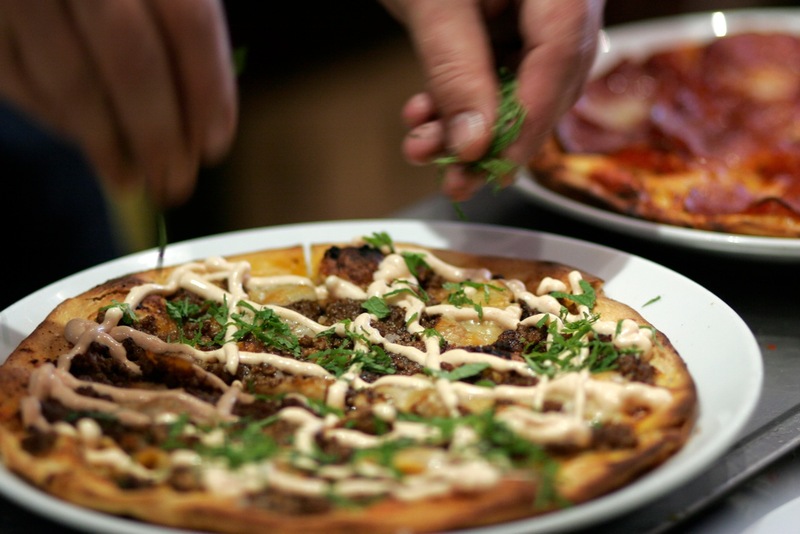 Nestled in the middle of the Waymouth food mecca is Melt CBD – a restaurant specialising in gourmet pizza and tapas. The brainchild of Melt in upmarket Hyde Park is not a stranger to success – attracting hordes of hungry punters for their inventive Italian dishes – here the dishes are about using more flavour and less ingredients. 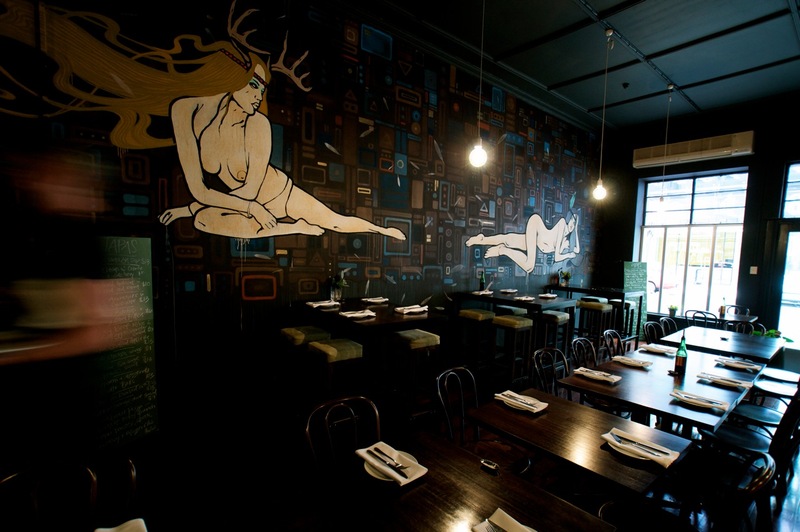 Modernistic art work flanks the walls in this sleek and sophisticated establishment. The hanging filament globes create a sense of warehouse urban cool. There is a certain stereotype about the crowd – predominantly young and hip Generation Y’s By 7.30pm the place is rocking, full of rowdy large tables chugging wine by the glass and competing for air space with the thumping soundtrack. Not a place to come for a private first date unless you want to share it with your neighbours. One look at the menu may induce the hungriest of patrons to start salivating. It looks good and full of promise. You won’t find hawaian and super supreme here. These are pizzas for the more adventurous of palates – ingredients like pomegranate, provolone and roasted duck. Succulent soft shell crab with chilli and fresh coriander and pork belly with pear and fennel salad are some of the things you can expect on the daily changing tapas menu. After getting massive food envy from our neighbouring tables, we couldn’t go past the pizzas. The Turk pizza is a palate popping mix of lamb, pine nuts, pomegranate, provolone, mint and sumac finishing with a generous criss cross of greek yoghurt and a sprinkling of parsley. The sweetness of the pomegranate and coolness of the provolone offset the spicy lamb beautifully. If you are expecting tender chunks of lamb you may be disappointed since it is topped with a spicy lamb mince. The Turk is a modern twist to the Turkish lahmacun; a thin dough topped with mince meat, vegetables and herbs, then baked. The patatas pizza is a decadent carb-centric concoction of crushed potato, porcini, truffle, mozarella, creamy tallegio and a final sprinkling of thyme and parsley. The potatoes had a lovely crispness and a delicious moreish texture. Unfortunately, I am highly allergic to walnuts so skipped this ingredient but am sure the earthy texture would be a delight with the tallegio. The crust itself is thin and crispy with a slightly misshaped rustic authenticity. If you want an over stuffed cheesy pizza, or whatever they stuff it with these days, I’d suggest going to your local Pizza Hut. And for dessert – of course there are dessert pizzas if you can find your second stomach. As for the service, it left a little to be desired. Lucky the pizzas were good. Will definitely be back soon to try their tapas. 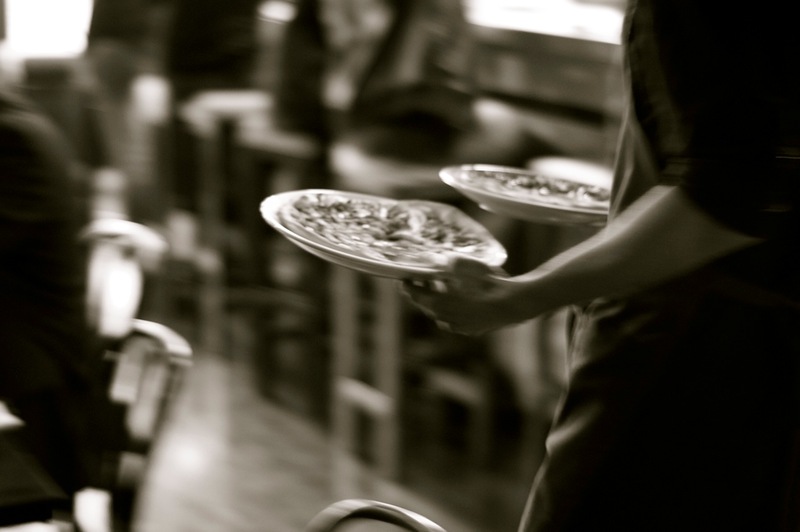 Approximately $35 per person for one pizza, a glass of wine and service.